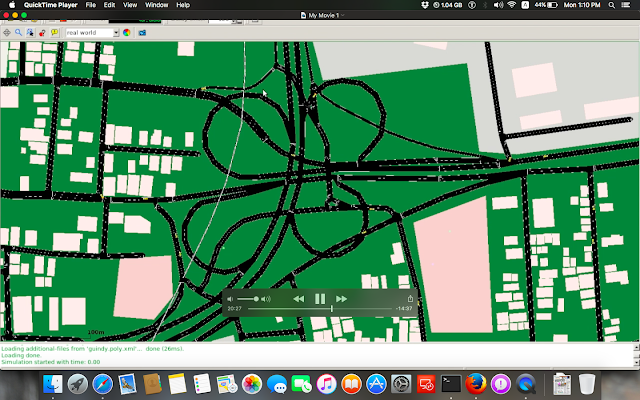 #SUMO can able to convert the osm file to its native xml file. The post tells you the simulation of a real traffic network and how it is ported to #ns2 for network animation and tracing. Also, Download the sumo source sumo-src-0.26.tar.gz from this link and unzip or untar it to the home directory (/home/pradeepkumar). There are some python files that are needed to generate random trips and to export xml files to tcl files. the commands sumo, sumo-gui will run only the graphical simulation. Open browser and type http://www.openstreetmap.org and search a particular area and click export in the top. Now, copy the osmPolyconvert.typ.xml from the $SUMO_HOME/data/typemap/ and copy it to the folder where you put all the files. The generated guindy.tcl have to be modified or altered as per the networking parameters like routing protocol, Mac layer, physical layer, link layer, etc. You can see the following video for all the instructions. $ns_ at 100.01 "puts \"NS EXITING...\" ; $ns_ halt"
Just comment below if you need any queries (the above video will give you full information).